Forecast: Kitty Boom Boom is a progressive sort fresh from a maiden win over this course and distance in mid-February, and a steady series of workouts since that race indicates she’s primed for another strong effort. From the rail she’s practically guaranteed a ground saving trip from just off the pace. An Eddie Surprise might be a tad more effective sprinting but just finished second under these conditions just nine days ago and today is reunited with “win rider” Gutierrez. She’s the likely favorite and one to beat. Forecast: Martial Eagle, a strong, long-striding first-time starter by Curlin, makes his debut in a below par maiden special weight main track miler and seems ready to win at first asking following a good series of drills for Baffert. He’s not a quick type but should be able to produce the last run. Nolde, a distant third in one of the strongest maiden sprints of the meeting (first and second-place finishers Omaha Beach and One Bad Boy both came back to win), has a far easier task today in his first try around two turns. The son of Pioneerof the Nile appears on paper to be the best of the known element. We’ll put Martial Eagle on top but include both in our rolling exotics. Forecast: ​Super Patriot drops to her lowest level ever and may have found her friends in this $32,000 claiming turf miler for fillies and mares. She has two prior wins over the local lawn, retains Van Dyke (who knows her well) and should be able to wear down the leaders late. Drift Away is the one to fear most. She’s been chasing tougher without success of late but in this league the daughter of Congrats could easily snap back to winning form. She’s likely to draft into an ideal pace-stalking position. Both should be included in rolling exotics play; we’ll have a few extra tickets keying Super Patriot. Forecast: One Eighty has trained well enough for his debut to be a strong fit with straight maidens and looks like a live item here for O’Neill, especially from the cozy outside draw. The son of Jimmy Creed brought $300,000 at the OBS March sale last year, so you know he’s very well regarded. The two main contenders exit a fast, highly-rated sprint won by Bump Bailey. Duchamp broke slowly and then picked it up late to finish third in a hot race while needing the experience. The Shirreffs-trained colt retains Talamo and seems likely to improve and be heard from late. Both should be included in rolling exotic play. Forecast: Jan’s Reserve has much in his favor in this extended sprint for $40,000 claimers. He’s a first-off-the-claim for Puype with solid recent form at the level, and from his comfortable outside draw the son of Ready’s Image should take full advantage of soft, pace-stalking trip. He’s never been keen on winning but today looks like his day. Sheer Flattery returns to his winning level and shows the route-to-sprint angle for Knapp. In fact, this seven-furlong distance might be his favorite trip. Both should be included in rolling exotic play with preference on top to Jan’s Reserve. Forecast: ​Painting Corners was a respectable fourth behind Belvoir Bay over this course and distance in mid-February and won’t find anything as tough as her in this field. From the rail, the Miller-trained mare should be on or near the lead throughout over a firm course that promotes her style. Let’s make her a straight play and rolling exotic single. Forecast: Hard Not to Love graduated at first asking in good style with a solid number and looks dangerous right back in this better-than-par first-level allowance sprint for fillies and mares. She’s drawn comfortably outside, thus providing her the opportunity to dictate the race flow. Tizanillusion seeks her third straight win, gets a ton of weight off with the switch to bug boy Velez, and is a tough, experienced, professional race mare. She can win on the lead or from a stalking position and on pure figures looks tough to beat. Hard Not to Love gets a very slight edge on top due to her potential but both must be included in rolling exotic play. Forecast: Kristi’s Copilot is re-equipped with blinkers, returns to the main track, exits a couple of tough starter’s allowance races and gets a big break in the weights with the switch to bug boy Velez. He’s most effective on the lead, so we suspect gate-to-wire tactics will be employed. Avanti Bello has been around forever and always must be respected. He returns to his claim level, shows a nice, recent series of works since his most recent start in in late February and seems primed for a forward move. Let’s double the race in our rolling exotics while preferring Kristi’s Copilot slightly on top. Forecast: Mind Trick looks intriguing in this maiden $50,000 claiming turf miler. The son of Strong Mandate closed a gap to be a willing third behind subsequent stakes runner Sueno in his debut last summer at Del Mar before being stopped on. He returns as a first-time gelding for O’Neill while displaying a reasonable series of drills at San Luis Rey Downs, and with Giant’s Causeway on the bottom side of his pedigree he certainly has a right to enjoy turf and two turns. 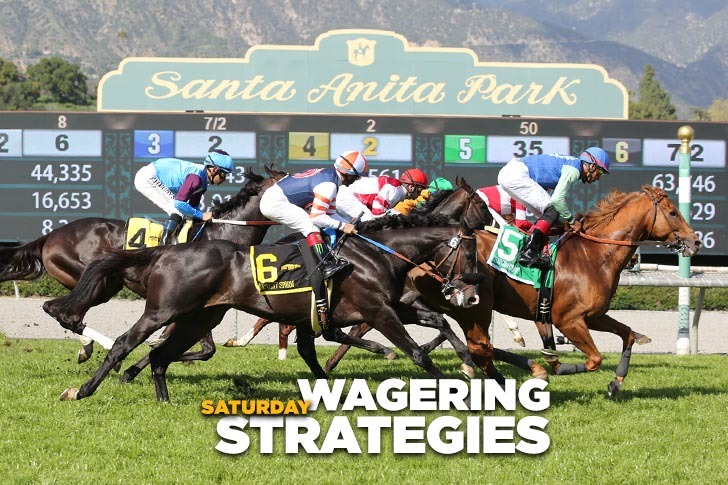 In a typical grass grab bag for this class of runner, let’s take a stand and make ‘Trick a straight play and rolling exotic single and hope to get close to his morning line of 6-1.